If you haven't heard of barre workouts by now, you might be living under a rock. 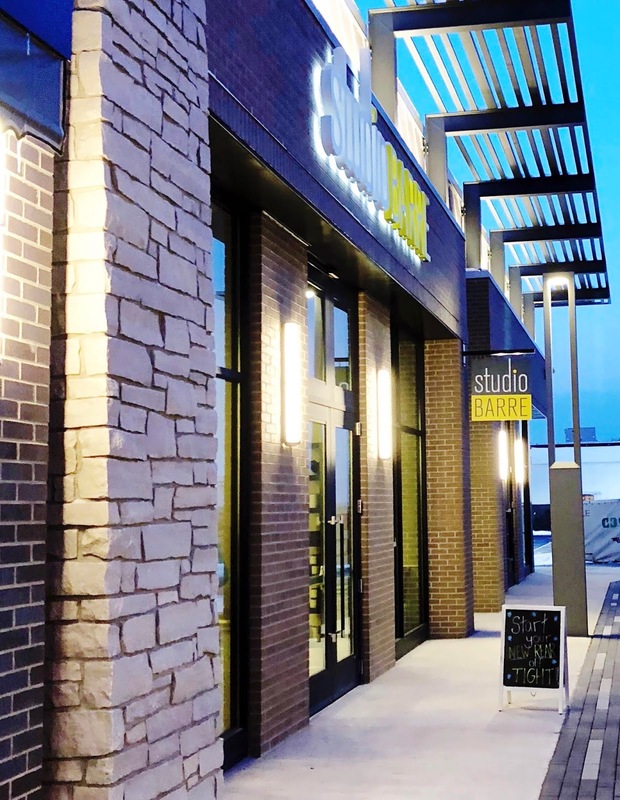 This newer fitness craze is taking over, and I've seen studios popping up like daisies...not only in Chicago, but in Grand Rapids as well. I've always been tempted to try barre (my roommate in college was a barre instructor) but I was terrified that I would literally fall over and die in class. 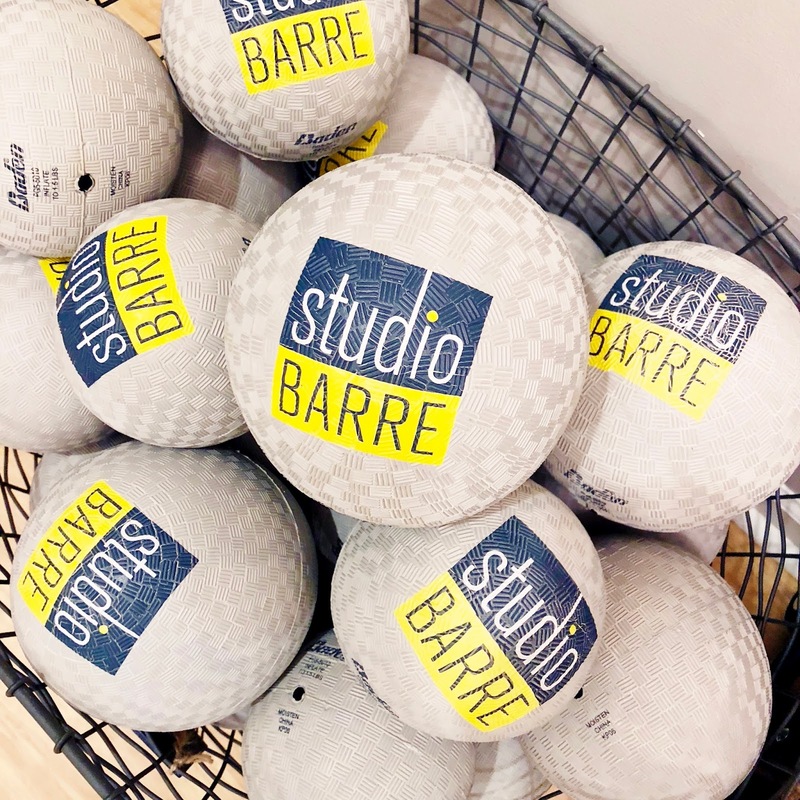 When Studio Barre Grand Rapids reached out to me and asked me to try one of their classes, I thought, "What the heck. If I embarrass myself I never have to go back!" Little to my surprise, that one class triggered a mild obsession and a new lifestyle that I hope to keep up as long as I can. First of all, can we just look at this studio?! I'm obsessed with their funky chandelier and yellow floral wallpaper. The modern, light atmosphere is so calming which is perfect during an intense, booty-kicking workout. Not to mention, this studio is always clean and fresh (they light candles in the lobby that smell heavenly). And for mamas, they have a darling daycare room for your little ones! You just have to give a 24-hour notice and pay a small $5 fee for the sitter. 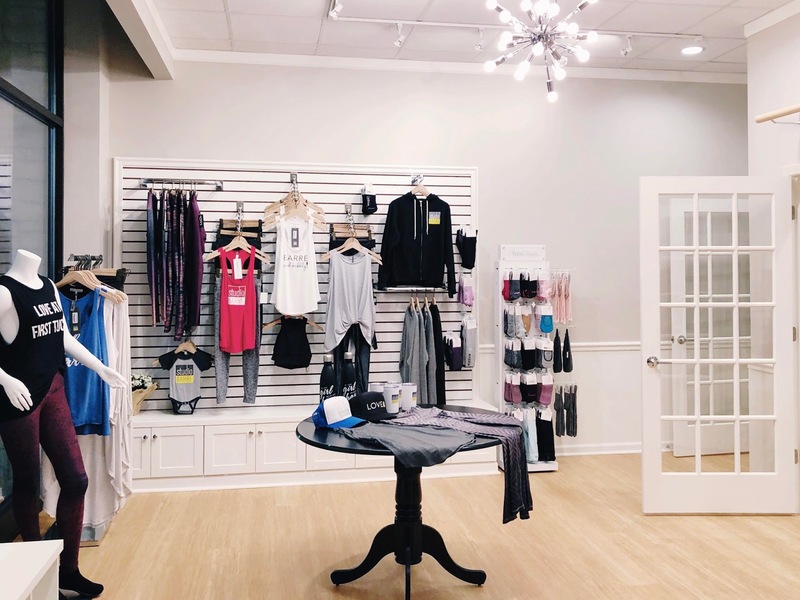 If you're coming straight from work, they have a changing room and a large beautiful bathroom so you can quickly slip into your barre attire before class. Their bathroom is also stock piled with essentials (deodorant, face wipes, etc.) in case of emergency! The barretenders (instructors) at Studio Barre Grand Rapids are so encouraging and treat me like I've been their friend for ages. Instructors Andrea, Jeanna, Sydney and owner Anna are all fabulous to their cores, and their encouragement throughout the 60-minute workout is inspiring. They never make me feel weak...I actually feel like a strong boss lady during class! I've gone to fitness classes where I feel uncomfortable from the moment I walk in to the second I leave. I've not once felt uncomfortable or out of place at Studio Barre. Plus, the audience is so diverse. Women (and men) of all ages, sizes and fitness levels are in the same class, making anyone feel right at home. Now, let's talk about this workout. It's hard. Like, really hard. But you get what I like to call "barre amnesia". You workout so hard and feel like crumbling over and dying while you're in the moves, but the second you leave the studio you feel stronger, leaner and more energized. You forget all the pain you just went through and focus on how amazing you feel afterwards, and just keep coming back for more. It does get easier after your first few classes, but I don't think this workout will ever be "easy". The class is broken into five sections: warm up, calves, thighs, seat (booty) and abs. There's some stretching and a "cardio snack" in between sections which helps the class fly by. The class combines traditional ballet poses with modern day pilates moves. It's all about small, consistent movements. Many of the positions are done on relevé (on your tippy toes) which makes your legs shake like an earthquake. You may think shaking is a sign of weakness in barre, but you WANT your limbs to shake. "Shaking legs are changing legs!" the barretenders often say during class. In my research, I read that when your muscles shake, they're actually tearing, but after workout your muscles start to regenerate and bridge the gaps, building more muscle (I think I explained that correctly haha). Barre is a great metabolic workout, so not only do you burn calories during class, you continue to burn them after your workout as well. After my third or fourth class, I really started to notice results. My arms were more toned, abs were feeling tighter, and my legs looked way stronger. I'm never weigh myself because I measure my success in how I feel rather than a number, but I just so happen to have a doctor's appointment after my first month of classes (three classes a week) and I lost 10 lbs. Of course, results are going to vary with everyone, but this has been my progress thus far! Now, let's talk about the attire. One thing that sets barre workouts apart are the sticky-soled socks (seen in my first photo). These encourage traction during the workout and help you keep your feet planted, especially when you're on relevé. They start at around $12 at Studio Barre, but you can easily find them on Amazon as well. During class, I wear a tight workout leggings and simple tank tops. My advice is to wear whatever you feel most comfortable in, because if you're not, you'll be distracted the entire class and won't get the most out of your workout. 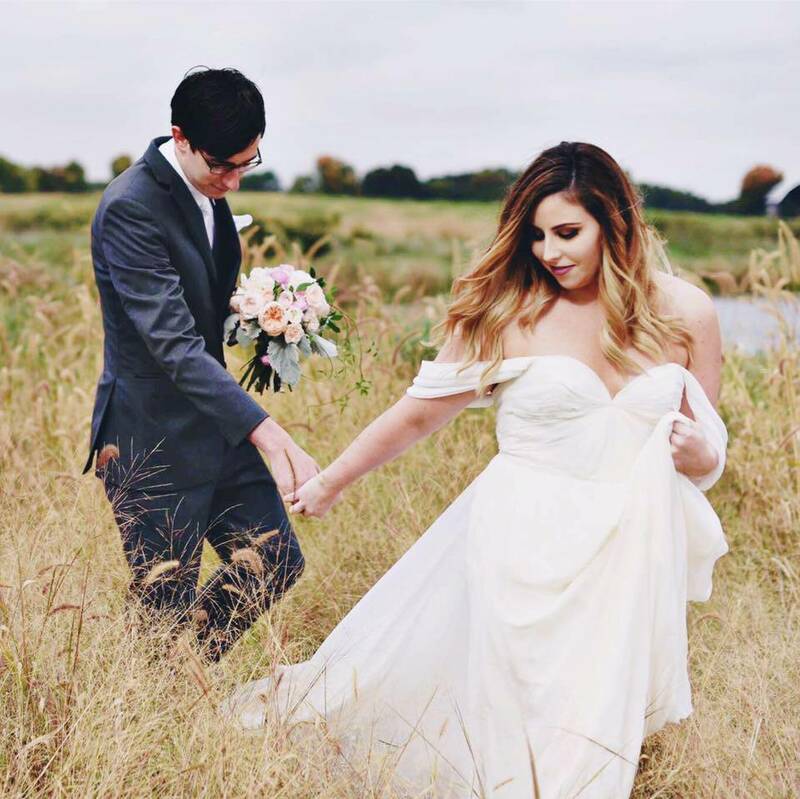 I've been open with my health issues in the past, and like most women my age, I struggle with feeling comfortable in my body. My anxiety and depression often causes me to fluctuate in my weight and overall health, and in order to keep myself healthy and happy, I need to stick to a schedule (even if I have to drag myself to barre on my off-days). But the ladies' friendliness and compassion at the studio make it easier to stay motivated. Studio Barre has not only made me feel welcome in their warm, comforting community, it's made me feel mentally stronger. It's my new form of therapy. I feel happier. I feel healthier. And most of all I feel supported. 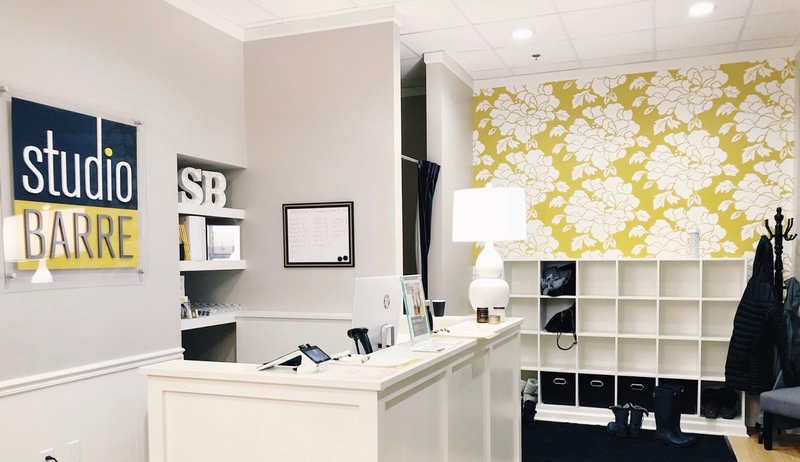 After I completed my first month of classes, I purchased their Studio Barre Society package and will be on the barre for at least the next three months (you can find all their pricing and packages here). If you've been thinking about giving barre a try but have been too nervous, give it a shot! I promise you, everyone else is going through the same pain you are and we're in it together! And if you ever want a barre buddy, just message me on Instagram and I'll meet you there! Disclosure: Studio Barre Grand Rapids provided me with a free one-month membership in exchange for this post. All opinions are my own!